We are continuing our once-amonth Saturday morning hour of Adoration and prayer for all the ladies of the parish. 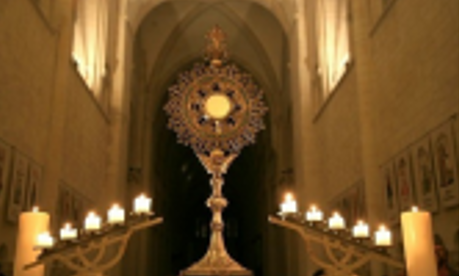 During this hour of Eucharistic Adoration, we pray a rosary for an end to abortion, euthanasia, human trafficking, genocide, and all other forms of abuse and exploitation of people throughout the world. We also pray a Chaplet of Divine Mercy in reparation for our sins and the sins of the world. We invite you all to join us in this time of spiritual combat against the powers of darkness. It is a marvelous opportunity to grow closer to God and to build up His kingdom on earth. We will meet on the first Saturday of the month form 7:00 to 8:00 A.M. in the daily Mass chapel. If we have enough ladies, we will move to the main church. Our next session will be Saturday, January 6. Bring your rosaries, and we look forward to seeing you there.